The Truman Show was filmed in Seaside, Florida, which for the most part, is exactly how it looked in the movies: perfectly manicured, well-planned, and very clean, just like Truman's bubble. 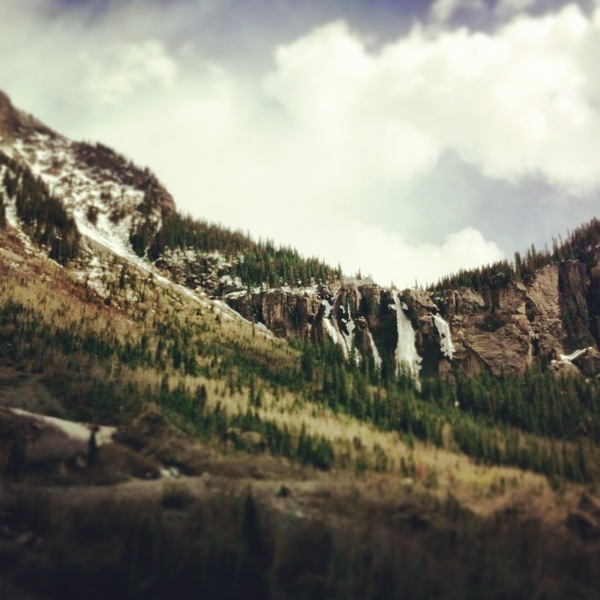 If they had filmed that movie in Colorado instead of Florida, I would bet Telluride would be the location of choice. 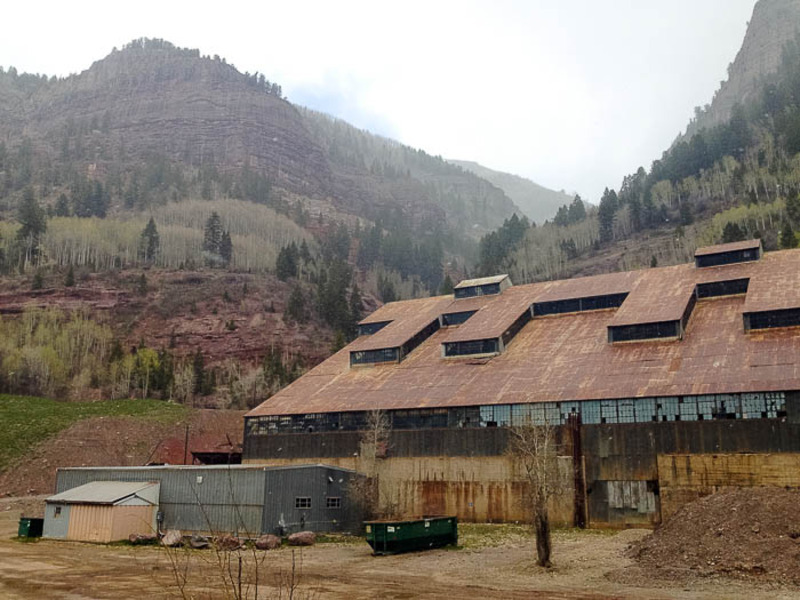 What was once a mining village is now a carefully crafted ski town, cozily nestled in a canyon at the base of the San Juan mountains, with only one road in and out. 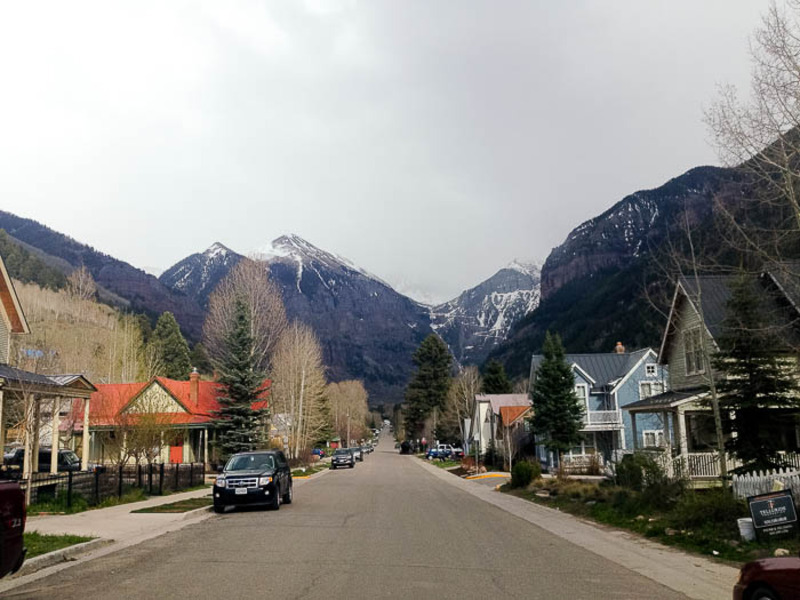 It's got the picturesque Main Street with old-timey buildings that are well-preserved, and off to either side are blocks and blocks of perfectly cute little houses lining streets where beautiful children ride bicycles and mind their manners. But we weren't there for the cute houses - we were there to see Bridal Veil Falls, and it was easily visible from anywhere on Main Street. Once you make it through the gift shops and bakeries and restaurants, the road narrows, and sends you directly into an old hard-rock mine called Pandora. The trailhead for the falls actually starts in the dirt parking lot of the old mine. The trail was full of switchbacks and random clumps of snow and felled trees, but each step gave a better and better view looking down into the canyon at the town below. Since I had just lost my camera a few days before, I was stuck shooting with my phone, which I naturally forgot to charge the night before. 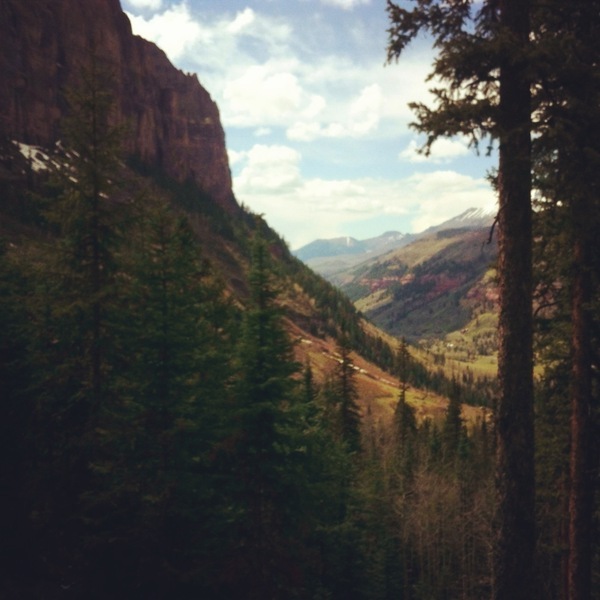 Halfway up the trail, my phone died and I was completely camera-less. 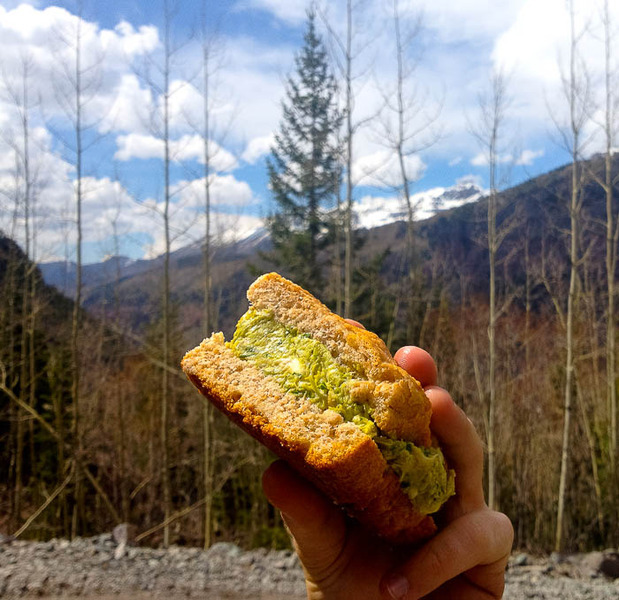 We stopped to enjoy the chicken and avocado salad sandwiches on Laura's homemade focaccia bread, and after one more switchback, we found ourselves staring in sheer awe at the base of the falls. I had never seen anything like it, and being without my camera(s) was both a blessing and a curse, because I couldn't record what I was seeing but I was also free to just experience it for what it was. 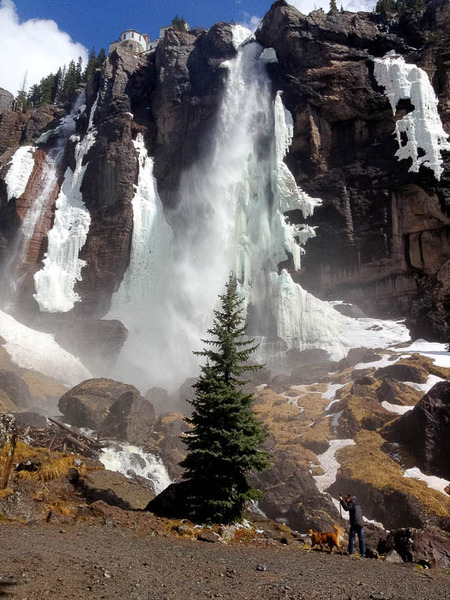 The 365-foot tall waterfall thunders at the base while simultaneously showering you with the a gentle mist. It was hard to leave, but after the long hike, we were ready for a good beer. 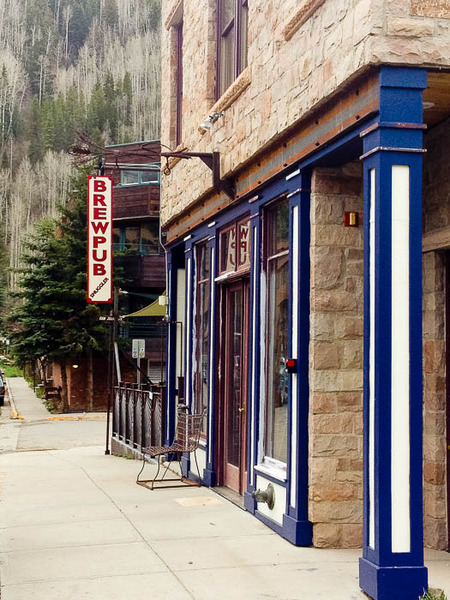 Enter Smuggler's Brewpub (named after the Smuggler Union Mine, for which the hydropower plant at the top of the falls was constructed back in 1895). I can't tell you which beers we had, but I can tell you there were delicious, and so were the tater tots we had with them. On our way out of town and back to our campsite, we hit a first for our trip: we got pulled over. After stopping at a stop sign and continuing on down the small side street we were on, I thought it strange that all the cars were parked facing towards me. 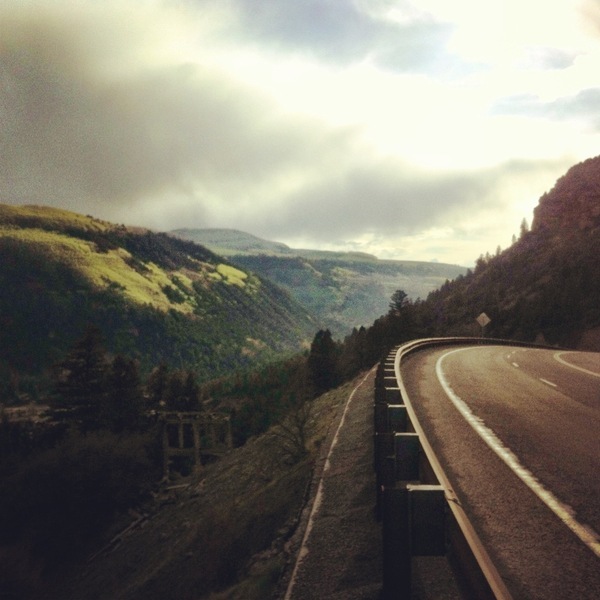 Next thing I knew, the blue and reds were flashing in my rear view, and we stopped, still not quite realizing we had driven down one of only two one-way streets in Telluride. The young rookie cop seemed overly aggressive about what was clearly an accident by some out-of-towners, but after checking out our insurance and registration, he let us off with a stern warning. Special thanks to Bonnie (who suggested check out the Free Box and Mt Wilson views exiting town, Sites while driving through.., and Hike, Eat, Jeep ( weather permitg), Marvel at nature) and Simon M. (who suggested Do the main hike at the back of the town up to the huge waterfall. Also stay a while.) for making this blog post possible!